Fanta, the orange fizzy drink produced and distributed by the Coca-Cola Company, is known throughout most parts of the world. And yet how many people know that the drink originated in Germany? I was fascinated by the story when I read it for the first time. During the Second World War it was not possible for the German Coca-Cola subsidiary to import the raw materials necessary to make the original Coca-Cola drink. Faced with the problem of not having a product to sell, the German bosses came up with an alternative product made from what was available at the time. 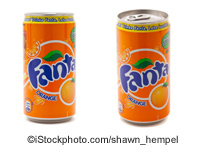 The name “Fanta” stems from the German word Fantasie (fantasy). Amongst the products used were the leftovers from cider and cheese production! I do wonder how many other things that are known worldwide were invented or discovered in Germany, without that fact about them being well known. Two that spring to mind – although they are almost 100 years apart – are X-Rays (by Wilhelm Conrad Röntgen) and the MP3-format (by the Fraunhofer Institut). If you ask for a “Spezi” in a restaurant in Germany, then the most probable drink that you will be served is probably going to be a mixture of cola with orange lemonade. However, the term is actually a registered trademark: Spezi® and belongs to an organisation called the “Spezi Markengetränkeverband Deutschland e.V.” which is a collection of 13 breweries that produce a drink by the same name. Breweries? Yes, not only was I not aware of the trademark until recently, but even less did I suspect that the drink used to be a type of beer. And yet the product is familiar. I have drunk products labelled as “Spezi” in the past, probably not realising that I was drinking something special. It’s even a slightly different mixture, as it contains orange juice. However, other products on the market using the orange lemonade recipe, “Mezzo Mix” for example, which is produced by Coca Cola, are still referred to colloquially as “Spezi”. Not by their manufacturers, of course, but by the people buying and drinking them. Some restaurants even mix it themselves from Coca Cola and Fanta, or Pepsi and Miranda, and write it on the menu as “Spezi”. I wonder how many of them have no idea that they are using a trademark without selling authentic product? There are also regional names in some parts of Germany for the mixture of cola and orange lemonade. My favourite has to be “Kalter Kaffee” (cold coffee), but particularly confusing is the fact that it is apparently called “Diesel” in Cologne – anywhere else that refer to a mixture of cola with beer. Spezi on the other hand can still mean a drink mixed with bier in some areas, or even with spirits. So what does the unsuspecting tourist do when they want to try this particular German drink? Ask the waiter would seem to be a reasonable suggestion if you are visiting someone new, unless the menu specifically refers to the trademarked drink. I shall certainly be looking closer at any menus that I read in future to see which version they offer. I’ve already found two interesting cases. One says that their drink is “selbst gemischt” (self-mixed), and the other one avoided the trademark altogether and sold me a “Speetzy”! … as long as they can be seen. That was the impression left by a visit to one of our favourite service stations on the way from England yesterday. The sign on the door says “Kinder sind hier gern gesehen”, meaning “children are welcome”, but actually translated as something like “children are gladly seen”. "Kinder sind hier gern gesehen"
Anyway, we like this particular stop because they have good value family meals and it is at about the right place to have a break on the 6 hour journey from Calais to Frankfurt. As usual, we stopped there yesterday and ordered our meal at the warm food counter. We then let our daughter go to play in the childrens’ area which is located between the food section and the seating. This was our mistake. When we came to pay at the cash desk, we were charged the full price for our drinks because the cashier could not see our daughter from her viewpoint. This all made very little sense, as she was still prepared to charge the food as a family meal, so accepting that we could have the deal on the food but not on the accompanying drinks on the same tray!